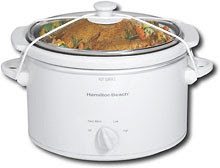 This Hamilton Beach 3 Quart slow cooker is marked down to $2.99 at Best Buy!!! Choose in store pick up to avoid shipping fees, which are $6.64. (Of course they have none in my store...so shipping ends this for me) I hope you get lucky!!! Go HERE and check it out!